Khris Berry has been involved in the Pet Services industry since the early 1990's. She has owned grooming shops, boarding kennels, and obedience training schools and is a Certified AKC Canine Good Citizen Evaluator. She is the co-founder of See Spot Grooming & Daycare which currently operates 3 locations in 2 states. Her vision has led her to create a Groomer - centric company which provides education, a positive work atmosphere, and benefits for all Spots. She owns and competes in a variety of events with Wirehaired Vizslas including dock diving and obedience. Jennifer Bishop-Jenkins, ICMG, is the owner and Master Groomer at Love Fur Dogs in Glencoe, Illinois. Named by the Chicago Tribune as the "Best Groomer in Chicagoland", Jennifer can be seen this fall 2018 on the Hulu Network national television program Small Business Revolution (Season Three) as a Grooming Expert. 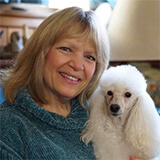 Jennifer founded the Illinois Professional Pet Groomers Association and has been grooming, breeding, and showing various breeds of dogs and cats for four decades. She authored several published articles on various grooming issues, and has an award-winning blog. Jennifer was one of the first generation of "CMGs" but spent most of her career as a professional educator teaching high school, college, and also in vocational grooming schools. Jennifer and husband Bill are nationally prominent victim advocates, and love the fun they have showing their newest Grand Champion Miniature Poodle "Bowie". Kathryn Dixon, a Nationally Certified Master Groomer, has been involved in the grooming industry since 2006. She owns and operates The Houndstooth LLC, a mobile pet spa fleet which services the majority of Rhode Island. She is an active competitor in grooming competitions across the country, holding multiple placements in Hand Stripping, Sporting, and All Other Pure-Bred classes. In her free time Kathryn trains in Canine Scent Work and has earned titles on two of her dogs. She is also a Veteran of the United States Marine Corps, having served 6 years as an intelligence analyst and translator of Afghan languages. Lara Latshaw is a NCMG, Pet Tech CPR/First Aid Instructor and open level competitor. She has been grooming for over 18 years and opened her own salon in 2013. Prior to that she worked as Chief Grooming Officer for Hydrodog in Tampa, FL where she gained a tremendous amount of customer service and marketing education. Lara's salon, Gordon's Grooming, recently expanded into a new location, going from 192 sq feet to 2,000 sq feet. Shannon Moore is a Certified Master Groomer for NDGAA as well as IPG. She owns, breeds and handles Bichon Frise's in addition to her recognition for one of the top breeders of Yorkshire Terriers. She founded and owns Pink Paw Pet Spa & Resort in Birmingham AL. Shannon is an active competitive groomer. Cindy Oliver is an award-winning Pet stylist in Breed Profile and Creative Grooming. Her specialty is extreme creative styling and creative abstract design. Cindy is owner/groomer of The Rollin' Doghouse Mobile Pet Grooming in Cleveland, Tn. She has 21 years of grooming experience, and has been mobile for 12 years. She started competing in breed profile and creative in 2009. Member of Artero USA and a groomer in Port St Lucie, Fl. Been in grooming industry since the age of 14 as both a bather and a groomer. Graduated from Merryfield School of Pet Grooming, and became a Nationally Certified Master Groomer with the NDGAA only 6 months after. Winner of numerous grooming competition awards, including a Best in Show, jumping from lowest division to being ranked in the top 15 in just one year. Nominated for Barkleigh Honors “Up and Coming Groomer of the Year” award for 2018. As a second-generation groomer, Macie has been immersed in the dog world her whole life. She has been grooming professionally since 2010. Macie started competing in 2014 and quickly rose to the top, becoming one of the youngest competitors in open division. In 2016 she was nominated for the Barkleigh Honors Up and Coming Groomer of the Year Award. She will continue to travel and compete nationally until she achieves her dream of making GroomTeam USA.